Just like the first volume, Worth's memoir delivers! This is less about descriptions of midwifery and the sisters and more about people outside. The first section is about workhouse children and focuses on Jane (Season 2), Frank, and Peggy (brother and sister from Season 1, Episode 5). It is not easy reading! It is so hard to read about the inhumanity of those places. The second section is about the trial of Sister Monica Joan. What a character! The last section is about the Joseph Collett, the elderly man and former soldier whom Jenny befriends in Season 1. I continue to be amazed at how well PBS has adapted these books! I have the third one on my Kindle ready to go! I am not a huge science fiction fan, but I have grown to love and appreciate C.S. Lewis. His writing is so profound that sometimes he would make my head hurt, but now I am older and better able to understand his deep thoughts. He has deep thoughts in this book too, only in fictional form. His writing is lyrical, and I loved this. I cannot wait until the next one! I might even like this better than Narnia! I cannot keep up with the progress of my soul right now. I have had a great two week break (starting tomorrow) from writing, but I am itching to get around to seeing how I can publish the Bible Book Club e-books. I have no idea how I might do it, but there was a free e-book offer on Facebook about writing books in a weekend. So, I downloaded. It is good to take a break. It has left me more available for Elizabeth as she has been here since July 15. I am available to take her places in this hot weather, and yesterday, we had quite a few hours together bringing crutches to and talking with Cully (bad ankle sprain) and going to lunch at Sunnyside Up. I offered to have us continue watching Downton Abbey, but she visited with her friend. She came back and said she wished she had watched DA to re-energize for her dinner with the Trivetts and 9-11:30 pm time with Aaron. She was bushed in the afternoon, but she got up this morning and left by 9:15 am to go somewhere with another friend. I was going to do this every other month and have forgotten. I have a few minutes for short reviews. Rewatch with our kids (since they read the book). Excellent acting and adaptation of the book. Jennifer Lawrence IS Katniss. The hand-held camera is a big annoying but adds to the tension of the film. This is a movie AGAINST violence. People just do not get that sometimes. Audrey Hepburn and Fred Astaire. Need I say more? It was so delightful. A woman becomes a model after working in a book shop. Amazing dancing, music, and great fun. S'Marvelous, S'Wonderful! I think everyone needs to see this trilogy. The acting is somewhat wooden, but it follows the book pretty faithfully. "Who is John Galt?" It is an interesting commentary on capitalism versus socialism. I have had this blog since Fall of 2004, but I have only posted 991 times! I have posted so much more in the last couple of years than all the years combined because I started doing book reviews! I am back to physically journaling in a book now that the Bible Book Club writing is done. So, I might possibly not journal here very much anymore. I will like that change. I am pretty tired. I think I got borderline heat stroke/exhaustion yesterday. I could feel myself getting sicker and sicker as I pedaled home from the grocery store on my bike. I came home and drank water. and I rested until I had to work to get ready for Elizabeth's party. I felt better by then. Well, I am going to go read my book so that I can enter for another drawing at the library! I might not finish it today, but I would like to! Tomorrow is my 23rd wedding anniversary. So, I am gone for all day playing up in the Portland area! "The true secret of happiness lies in the taking a genuine interest in all the details of daily life." Watch the one-minute movie, The Years Are Short. From Gretchin Rubin's The Happiness Project daily email. I thought I had "slept in" this morning only to find out that I had 5:04 hours. Sigh. Above is my sleep average for the last seven days. I always say I only need 6 hours. Here is the proof from my BodyBugg data. I try to sleep more, but it just that gene that I have in my body. I have finally contacted the researcher, and I am going to participate in their "Sleepless Elite" study in August. I just have to wear their device for 10 days, journal before falling asleep and when I wake up, and take a DNA test. I hope I can help those who have chronic sleep problems. But more importantly Jesus, the Messiah, is my hero, and Handel (and Jennens) helped me see Him even more clearly. Messiah in June and July! This is my third time reading this. I listened to it on audio the first two times, and you can see my review below. I bought the Kindle version because I wanted to be able to underline things in it and use it as a reference book for writing my devotional on Messiah. It is so much better to read it than to listen to it! I am convinced the narrator is not the best "voice" for the author. I liked it so much more just reading the printed version. It is heavy on the music, but I needed that since I am not an expert on Italian oratorio, secco recitatives, arias, etc.! I learned so much more being able to see it in print and think I really understand and appreciate Handel's Messiah even more! (Is that even possible?). I thought I had this novel idea to write a devotional book through Handel's Messiah, but someone had already done it! My emphasis is a bit different, but this is a wonderful little book, and I even corresponded back and forth with the parish priest in Oxford, England who wrote it! He even had a parish in the Cotswolds; a place I dream of going to one day (think of a pastoral English countryside, and that is the Cotswolds). He has written many books, and he was delightful and so flattered that I would want to quote his book in a few points in my devotional! What a lovely e-mail! I'm so glad you're doing your devotional blog on Handel's Messiah (or rather, I suppose, My Jenning's selection of words from the Bible which Hanndel [sic] set to his unforgettable music!). By all means quote as much as you like from my book - I'm just flattered. June and July have been awesome months for finishing BHAGS. Last month, I finished the classics journey. Then, I finished the desire I have always had to study and then lead people through the entire Bible. 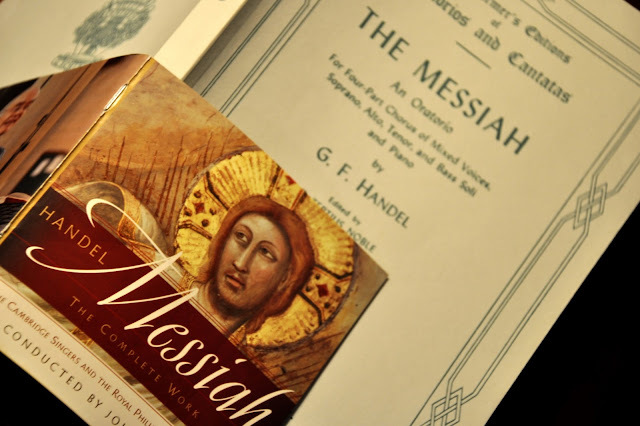 Now, I am closing in on writing a devotional for Handel's Messiah! I am 2 1/2 posts away with 15 minutes 54 seconds of music, 10 pages of one reference book, and 3% of another (on Kindle so do not know pages left) from completion! It has been a lovely journey. I love waking up every morning with Scripture set to Handel's beautiful music playing in my head. I struggled mightily through Psalm 2 (it is playing right now on the sampler). God telling Jesus He will "break" the nations is sometimes hard to swallow. Finish Messiah Part Two by Tuesday! Finish Messiah Part Three by Thursday! So I continue with the soap opera! I am addicted to this great narrator and the beautiful classical music between each section. I guess I am not in for tackling a long Dickens audio right now (even though I have 36 hours and 33 minutes of Our Mutual Friend loaded and waiting for me on the iPhone). These abridged sections of Remembrance of Things Past by Proust are only 3-4 hours long and are nice for a couple of days of walking. I know I am not getting the full effect, but maybe I will tackle all of Proust when I am retired. Remember I said that I must have missed the homosexual undertones. Well, I do not think they were in the first audiobook. They were in here, but they were tastefully done. The French aristocracy seemed to be pretty lose in their morals back then. I will have to learn more on that front. I decided to do my freewrite in the afternoon today. I wanted to get straight to writing for Bible Book Club (Messiah Meditations) instead of warming up my fingers. It is better for me to do it now because my brain always starts to shut down at about 2:30. I know it coincides with the dip in my serotonin/dopamine and change in my cortisol levels at this time of day. For the first time all day, I am craving food. I am never really hungry until 2:30, and my concentration goes awry now. I wish we could check into our hotel at three, but I have to wait until George gets off of work. I am hoping that this will kick my brain to get this last post I have been working on done before he gets off work. I really love where I am in Messiah. This is the part that makes me SING! Psalm 68 where He ascends, and we get the Holy Spirit and the GLORY GIFT for the spread of the GOSPEL. That is truly exciting for me!!! I am sitting upon my ball in my dining room typing for the Bible Book Club. I look out on the beginnings of a gorgeous Saturday in my backyard. I love these quiet moments before the background noise of boys (young and old) that murmurs low but usually present. I have this moment right now where I know You are here. You smile. This is my favorite day to do a freewrite. I guess I like the alliteration in "Friday Fifteen Freewrite"! I only registered on this book about 9 years into my 10 year classics journey. They say it is one of the most beautiful books in all of literature. Who knew? After I saw an old Shelby Foote interview on CSpan2 BookTV, I decided to read (listen to) an abridged version of the first book of the total work called In Search of Lost Time/Remembrance of Things Past. Shelby's mother gave him the entire novel in four bound volumes when he was 17 years. He had read through ALL the unabridged volumes nine times between 1933 and 1993, and the entire work is 3,000 pages! I admire Shelby Foote so much (he wrote the definitive Civil War history and was made famous when he appeared as an historian on Ken Burn's Civil War series) that I wanted to see what all the fuss was about. I am not feeling well this morning. I stayed inside from the pollen all day yesterday but still woke up with a raging headache. I am really needing complete rest, and I will hopefully have it after my house guest leaves today. I love entertaining guests; but on the heals of a busy week up in Hillsboro, it probably wasn't such a good idea and especially since it ended up being only 1/2 hour buffer between coming home and entertaining. It did not help that I walked around the Hillsboro Airport for two hours with such a high pollen count. Grass doesn't usually bother me, but I have not felt well for three days now. I will go ahead and take some Sudafed because that seemed to really help yesterday. "In 1970 I felt so lonely that I could not give; now I feel so joyful that giving seems easy. I hope that the day will come when the memory of my present joy will give me the strength to keep giving even when loneliness gnaws at my heart." Allergies were bad yesterday afternoon and this morning. I avoid Allegra because it constipates me (pardon the graphic nature of that sentence), but I am trying Sudafed right now and seeing if that helps. It seems to have helped, but I only got 61% sleep efficiency compared to my usual 90+% (Body Bugg Measures this, btw). So, I am not hopeful for a super productive day, but Heather is going out to lunch with friends and out to friends' house at night. So, I will just rest and read today and stay inside. It is supposed to be bad all week. When I start feeling better, I will go and work out and drive there (I hate to drive to a workout. It seems so counterintuitive to do so).